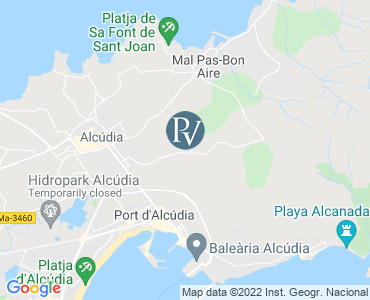 Villa Sansa is a contemporary, stone clad, six bedroom (Sleeps 12 or 14 with two extra beds) luxury Premier Villa located just outside of the old Roman town of Alcudia. Alcudia enjoys incredible sweeping views over the port, town, and mountains and as far as the bay of Puerto Pollença in the distance. The elegant spacious villa is superbly furnished and only a 5 minute drive to the attractive port of Alcudia where you can enjoy the waterfront Tapas bars and excellent restaurants along the ancient cobblestone streets in this delightful resort. The main door opens into the bright and welcoming hallway with double doors that lead to the exterior terrace and swimming pool providing spectacular views. The staircase from the entrance hall covers all three floors of the property. To the right of the hallway is the large fully furnished open plan, modern kitchen with American style fridge freezer, electric built in oven, separate gas hob, dishwasher, microwave and walk in store room. The dining area is adjacent to the kitchen with two sets of double doors that lead onto the upper furnished terrace. A twin bedroom is located in a hallway via a door from the lounge with adjacent separate walk in shower room. This bedroom is also accessible via a separate exterior door. On the first floor, there are three twin bedrooms two of which share a furnished terrace overlooking the pool and wonderful views. These bedrooms share a separate walk in shower room. The first master bedroom with en-suite full bath and separate walk in shower room along with the second master bedroom with en-suite walk in shower room are also located on this floor. Complimentary full 24 hour air conditioning. The magnificent 50m² eco-friendly swimming pool has roman steps and reclining sun loungers surrounded with expansive lawns affording magnificent views. Two parasols and pool towels are provided. The Garden terrace with brick built BBQ and delightful furnished dining terrace is ideal for alfresco meals whilst over-looking the swimming pool. For sports enthusiasts table tennis is provided. For your added convenience there is also a poolside shower cubicle.